At JiveWorld 13 SMZ/Pokeshot will be presenting our newest solution for social learning management: Pokeshot///SmarterPath. Traditional Learning Management Systems (LMS) haven’t kept up with the social business paradigm that platforms like Jive ushered in. They are focused mainly on the “management” part, resulting in being a tool that people visit once or twice a year. Alternatively they implement their own social elements, diminishing your investment in Jive. 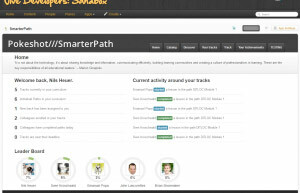 Pokeshot///SmarterPath embeds Social Learning directly into the Jive user experience. Training creators can leverage content directly from Jive as well as quizzes, HD video and online trainings to build their courses. Participants can progress throught their trainings while they work in Jive, and use the familiar Jive functionalities to collaborate with their peers.